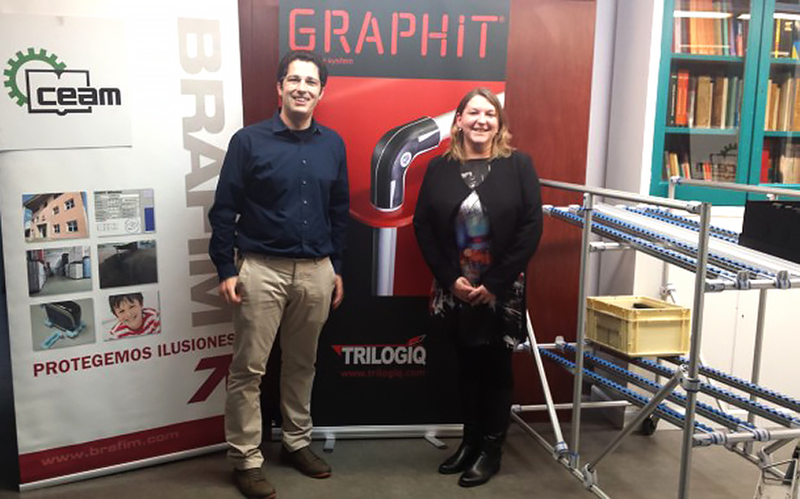 Daniel Fiestas from Brafim and Claire Martel from Trilogiq Iberia in the CEAM showroom. Team Iberia share the knowledge and expertise required in design and implementation management and production control systems based on operational excellence. 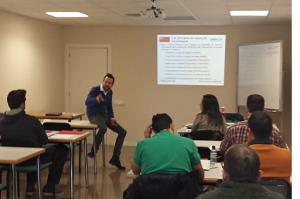 In March 2016 the Trilogiq Iberia team took part in Masters in design and optimization of industrial processes. The team was invited to collaborate with the Center for Studies and Metallurgical Consulting Barcelona by Josep Centelles (Professor of CEAM and Industrial Director of the company GAMO ). They were joined by BRAFIM, a custom packaging manufacturer,in kicking off the series of training days on Design and Optimization Process organized by CEAM and the Universitat de Vic. The Masterclasses are aimed at students and professionals with experience in production,engineering or continuous improvement as well as professionals who want to improve their skills in the design and optimization of industrial processes. The objective is to share the knowledge and expertise required in design and implementation management and production control systems based on operational excellence. The Masterclasses include theoretical and practical content to allow the students to learn about the implementation and management of optimal systems and enhancement tools in manufacturing which will drive production and increase productivity. The students also gain valuable insight into the essential requirements for implementation of technological innovation in production by analyzing data on the benefits of using quality products. This was a fantastic opportunity for our colleagues in Spain to spend time with students, exchange views and present our products, services, and solutions. They set up a small showroom with example applications so that students could experiment and get hands-on practical experience to support the theoretical part of the session and demonstrate how Trilogiq modular systems are ideal for implementing Lean. The Trilogiq Group supports training and good practice worldwide and has the experience in lean to connect, collaborate and help growth in manufacturing and 5S. Contact us. We are always happy to discuss your ideas.